Lachlan Chapman’s ute does 70,000 kilometres a year. Living on a lifestyle block outside the Rangitikei town of Bulls with a young family, it’s not unusual for him to drive to the Bombays and back in a day – a round trip of 900km. Such is the breadth of the AONet network. 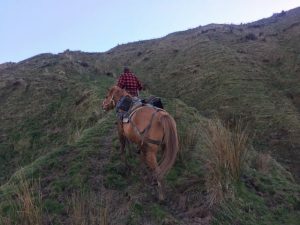 You need a decent breakfast to deal with that kind of workload – especially on days when the job involves leading a horse laden with radio gear up a steep hill. The wider Chapman family are farmers from long ago. 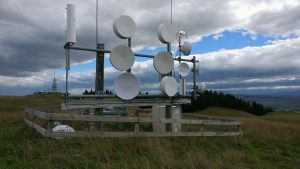 On the family farm in Takapau Lachlan found the satellite broadband appallingly bad. The family were fed up with paying $600 a month for poor reception. Lachlan developed a keen interest in the use of digital technology for farm management – sensors, system monitoring, climate and the like – he sees this as still “bleeding edge” but is convinced it has a huge future. So in the best farming tradition Lachlan decided to build his own connection. A family friend knew about radio, while Lachlan had always had a passion for Networks. A few friends with complementary knowledge were roped in. Suddenly Takapau was the site of AONet’s first connection, just off the State Highway. That was only 4 years ago. AONet is one of our youngest WISPs. Serving external customers as well as family farms was always the plan, but it mushroomed. There has been practically no advertising – just a modest Facebook page. Why advertise when you’ve got the kind of grapevine that links rural NZ? Today AONet covers a large swathe of the North Island. From Glenbrook and the Hunua Range in the north it runs west to the King Country town of Ohura, east to Hawkes Bay’s Waimarama and Ocean Beaches, and south to Rongotea on the outskirts of Palmerston North. It doesn’t always cover entire areas but instead infills areas not served by other WISPs – getting greater utilisation of existing sites trumps expanding the footprint. Customers number around 1500 with an average of roughly one wireless site for every 10 customers. The Chapman family farms are still integral to the business. “Its really handy having a supportive family and to draw on the resources of the farms, and the relatives often check on the sites and give on-site support,” Lachlan says. AONet’s office has 4 staff – mostly working on phones dealing with customer service. They also service a related business, ISP Ltd, which operates in the wholesale telecommunications market selling connectivity to IT and security companies. 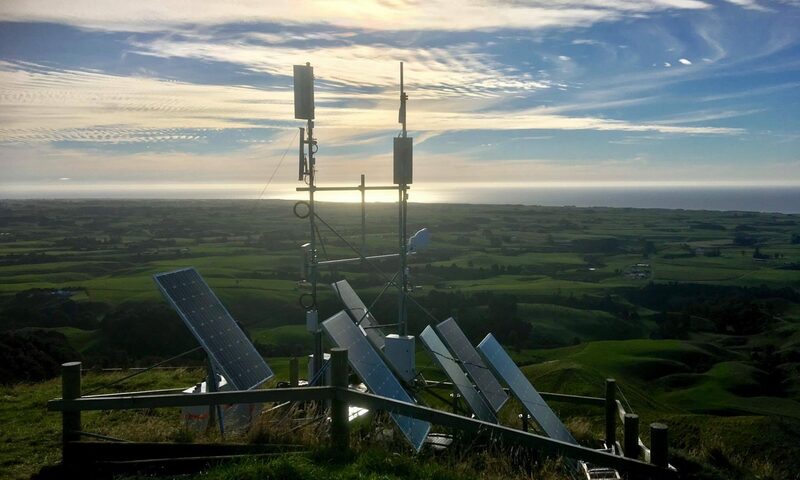 There are also several contractors based around the North Island who handle installation, development and trouble shooting. One of the latter, radio legend Bill Warrilow, was co-founder of AONet and manages the Ruapehu district developments, often carrying equipment for new sites on his back for 45 minutes at a time. 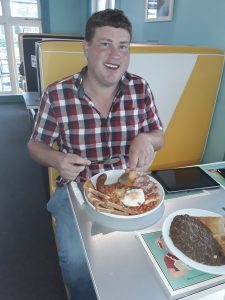 The day we meet for breakfast (Viv’s Café in Sanson – excellent mince on toast for me, a big breakfast for Lachlan) he is set to deal with paperwork around his near-complete chunk of the government’s RBI2 (Rural Broadband Initiative) contract. There’s also a site to be maintained in Hawkes Bay if the components arrive on courier early enough. No two days are the same. Spark’s capture of rights to the Rugby World Cup are a topic on everyone’s lips. Lachlan is looking to upgrade a number of sites in anticipation of a huge surge in demand. But its not just WISPs who will be under pressure, we agree – Spark themselves will be challenged to make sure hundreds of thousands of concurrent wireless video connections can be managed without letting customers down. Daniel Jefferis, a farmer all his life, hails from the Mangakahu Valley near the Pureora Forest Park west of Lake Taupo. In the old days his parents had Farmside satellite services on their farm, with poor speeds. More to the point, Daniel’s younger siblings used to chew through data to the tune of $600 a month routinely, and on famous occasions get into a fourth digit. At Daniel’s own 3500 acre property 10 kilometres away even Farmside was unobtainable. So when AONet became available around 2014 the difference was amazing. “I don’t watch any broadcast TV at all now,” Daniel says. “Its all on demand. I can use the Internet for business and research as well. We’re not yet into the “Internet of things” applications yet – new apps are coming along every year so that will come. Meantime its all about the administration of the farm. All that for $100 a month.” Daniel is clearly a very happy customer. Lachlan loves the customer contact aspect of the work – the opportunity to help people who have no other option. 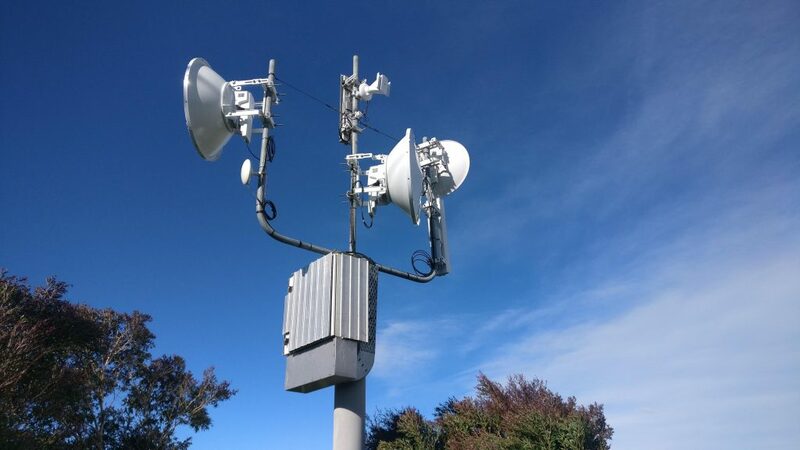 He is proud of the resilience of the network – during the heavy North Island floods early in 2018 one customer, tourist resort Blue Duck Lodge in the boondocks 40km west of Raurimu, was completely isolated for several days, but the AONet service kept the guests connected to the outside world. For the future, Lachlan is looking carefully at the next generation of satellites. In time they may displace today’s WISP technology, but not yet. Its an exciting, fast moving industry to be part of.